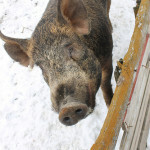 Yesterday was one of the first farm walks of the 2012 for the Green Hills Farm Project. Since I haven’t yet turned down a chance to go see Greg Judy’s Farm, I wasn’t about to miss it. The farm walk started out like most of the Green Hills gatherings do, with a big potluck dinner. 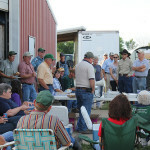 But after an hour or so of eating, enjoying the weather and chatting with all the other farmers, it was time for the main event. We all piled in our vehicles, and made a caravan down the road to the leased farm where the cattle were grazing for the week. There in the foreground is the fresh allotment of pasture, with the previous day’s pasture behind them. 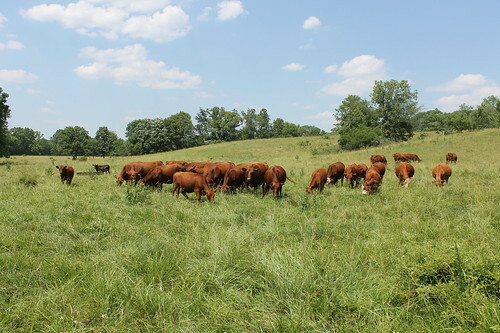 The pastures weren’t backfenced, as they are moved off before the cows get hungry enough to go back and hit the regrowth. As you can see, that’s some pretty good looking fescue pasture, especially given that we haven’t had any rain in 5 weeks. Greg pointed out a few individuals from the herd. This cow is fairly young, and right around the size he said he’s aiming for with his herd. She looked to be about 1000lbs and in very nice condition. 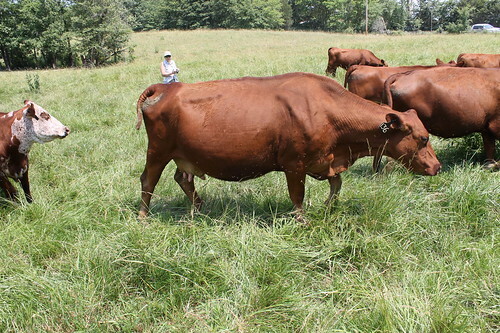 This, on the other hand, is 136, the cow that Greg said he’d had the longest. 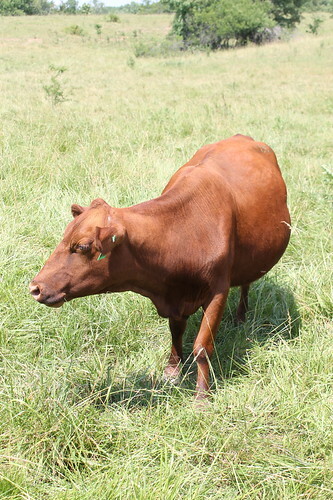 One of the only of his remaining red angus from his first herd. He estimated was 13 years old, and she had a bigger frame than the other cows in the group. 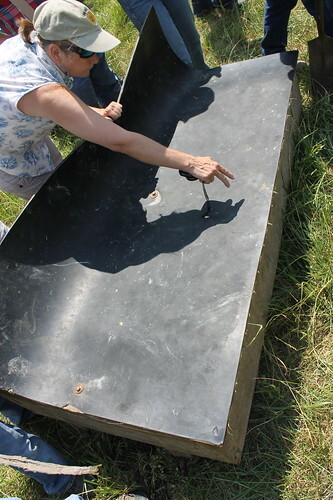 We then sauntered over to have a look at the mineral feeder. 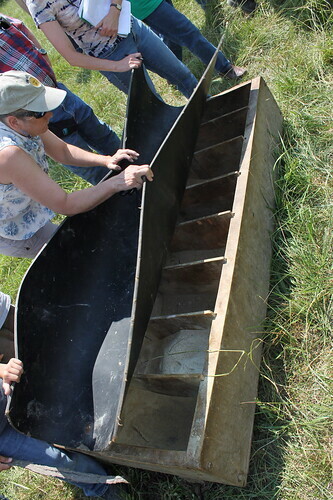 It’s made of what look to be 2×12’s with 4×4 runners underneath and it’s all covered by this big rubber flap. Inside, every mineral has it’s own compartment, so the cows choose what minerals they need. Interestingly he (and several other farmers there) had all recently started offering straight phosphorus to their cattle with the rest of their minerals. After much discussion of soil pH and after many refractometer readings it was time for the people herd to move on to their next pasture. Down a few more gravel roads we came to Greg’s newest lease, a scrubby piece of land that he was currently grazing his sheep on. Immediately upon arriving we were greeted with much barking from the Guard Dogs. 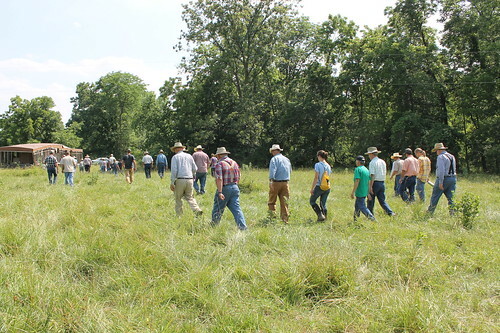 Greg explained that the scrubby look was a big improvement from the cottonwood grove that had been growing in this pasture several years ago. They cut down most of the trees, and the sheep kept the trees from growing back by browsing on any new growth. We all then met “Friendly Ewe” a Barbados Black Belly sheep who was evidently someone’s bottle lamb. 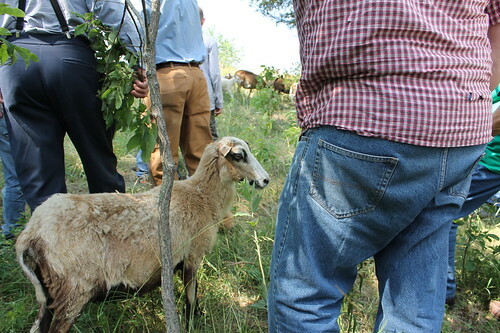 She is the “Lead Sheep” of the group, first up to follow a human to a new pasture. After a lot more discussion of raising and losing sheep “If you’ve got livestock, you’ve got deadstock.” it was time to head back to the house for a drink of water and some dessert. You can always learn a lot from Greg Judy, and you can always learn a lot from all the other old-timers who are in the Green Hills Farm Project. Get them all together in one place, and it’s quite a time. Enjoyed this commentary very much! This type of grazing is definitely innovative. Andrew, enjoyed taking the tour with you. Thanks for sharing! That mineral feeder is huge! You’d need a quad to move it. 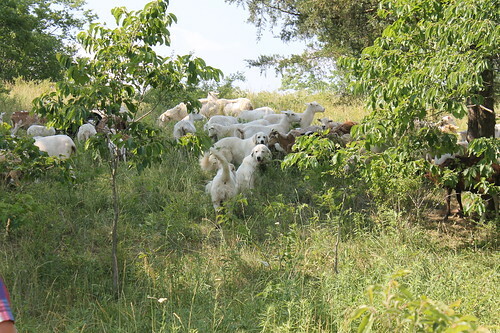 I love the photos of the sheep and the patou des pyrenees (as they call great pyrenees out here in the pyrenees). What stage of development is the sheep farm? I.e. how long has he been running his mob grazing system on it? You can see the effect of the lack of rain much more on the sheep farm than the cattle farm. Maybe the grass/soils there deal with the lack of rain better. The farm the sheep were on was a new lease, so they’ve only been on it a few years. It’s the most lush stand of broomsedge I’ve ever seen. Broomsedge is a good indicator of low N & pH, and considered a pasture weed.